At 6’2″, 277 Turk McBride was considered a versatile gap player that could handle both defensive end and tackle. His college statistics were pretty solid playing for the Tennessee Volunteers as well. 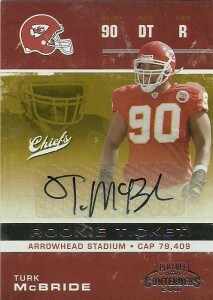 He registered 73 tackles, 52 assists, and 6.5 sacks over his college career through the 2006 season. McBride solidified his stock with a good combine displaying quickness with his 4.8 40 and a willingness to participate in as many drills as possible to be properly vetted by scouts. The Kansas City Chiefs used their second round choice in the 2007 draft on Turk and he’d be one of the featured rookies on “Hard Knocks” that season for HBO. In limited playtime starting 1 game he made 1 sack 11 tackles and a pass defensed. Shifted outside to left defensive end in 2008 McBride started 9 games but injuries ended his campaign after 25 tackles. He’d be cut in 2009, and signed by the Lions, starting 4 games that season, and 8 in 2010. Turk registered a career high 5.0 sacks and 3 forced fumbles in 2010 starting at right defensive end. He’d get some limited playing time with the Saints over the next 2 following seasons starting 2 games in 2011. In 2013 Turk signed with the Chicago Bears with the hope of fitting into their nickle package situations, but a ruptured Achilles ended his season before it began. Currently he is a free agent.